For this challenge, AAS provided the gardens with Winner seed from the last five years. They also had the option to incorporate any older AAS Winners from the past 85 years. Gardens not only had to create and execute a design based on this year’s theme but also had to generate publicity about the challenge and AAS Winners as well as submit photos documenting their creations. The judges were impressed by the creativity exhibited when combining edibles and ornamentals in each of the participating gardens. Many gardens were so successful growing their edible AAS Winners that they donated their produce to local food banks and food pantries! First Place Winner: University of Wisconsin Spooner Ag Research Station,Spooner, Wisconsin. Second Place Winner: Master Gardeners Association of Tippecanoe Country(MGATC), Lafayette, Indiana. Third Place Winner: Kenosha County Center AAS Display & Demonstration Garden, Kenosha, Wisconsin. Honorable Mention, “First Year Participant”: Miami University Hamilton Conservatory, Hamilton, Ohio. Honorable Mention, “Historical Reference”: Jennings Park Master Gardener Display Garden, Marysville, Washington. Honorable Mention, “Edible Sampling”: Parker F. Scripture Botanical Gardens, Oriskany, New York. Honorable Mention, “Food Bank Donation”: Southwest Indiana Master Gardener Demonstration Gardens, Evansville, Indiana. Honorable Mention, “Use of Display Garden Sign”: the Community Arboretum at Virginia Western, Roanoke, Virginia. Honorable Mention, “Providing Recipes for AAS Winners”: Rogers Farm Demonstration Garden, Old Town, Maine. Jardin Daniel A. Séguin made a very deliberate point to promote All-America Selection (AAS) winners and demonstrate to visitors that mixing edible and ornamental plants is a winning approach. Three areas were in this year’s challenge: the roof, the wall of the eco-friendly horticulture Pavilion, and ground level beds. By exploiting different surfaces, the garden showed an innovative approach to horticulture, demonstrating its full potential, including Canada’s largest edible green wall composed of more than 1,300 plants, made up mostly of AAS Winners. The AAS Display Garden was clearly identified with signs and identification tags. In addition to allowing visitors to identify their favorite plants, this information has an important pedagogical value for the students of the Agriculture Technology Institute of Saint-Hyacinthe who produced the winning plants in their classes. The AAS garden has been a source of discoveries throughout the summer with visitors capturing thousands of images and provoking many a “Wow” from visitors as well as from the contest’s judges. Third Place Winner, Tie: Green Bay Botanical Garden, Green Bay, Wisconsin. Green Bay reinvented the term Foodscaping and called their project “Ediscaping” and exclusively used AAS Winners dating from 1939 to the present. In their children’s garden, they utilized 5 different beds to demonstrate multiple designs mixing ornamental and edible varieties. One bed used Queen Sofia marigold as a centerpiece then arranged tomatoes in a diamond pattern around the flowers. Another bed featured Bright Lights Swiss chard and Prizm kale arranged in half-moons with other edibles and ornamentals creating a medley of color. Lastly, another bed had a “heat” theme featuring rows of hot peppers, including Emerald Fire and Flaming Flare. Ornamentals such as Zowie!™ Yellow Flame zinnia and Ring of Fire sunflower completed that bed. All produce was harvested from these beds by ASPIRO, an organization creating opportunities for people with disabilities to reach goals, connect community, and achieve independence. Almost 300 pounds of produce was donated to Paul’s Pantry, a local food pantry. Third Place Winner, Tie: Shell Park, Oakville, Ontario, Canada. Shell Park in Oakville, Ontario has created an AAS Display garden that has become the main attraction as you enter the park’s garden. It has increased the number of visitors who come to ask questions, learn and get ideas for their own gardens. Through companion planting and installation of a multi-tiered wall, they were able to educate the public on new ways to garden with vegetables. They found and explained how companion plantings (ex. tomatoes and peppers) increased growth and crop yield. A multi-tiered wall created from recycled materials was filled with a combination of edible and ornamental plants. It displayed an easy way to maximize plant material while saving space in a smaller garden. It also reduced the damage caused by animals and adapted the space to be more accessible. The perennial pollinator plantings from last year’s contest attracted a greater bee population which benefited this year’s growth. Due to a large crop yield, Shell Park donated a lot of vegetables to a local street mission that provided meals to the community. Honorable Mention, “Overcoming Challenges”: St. John’s County Arboretum, St. Augustine, Florida. First Place Winner: Dow Gardens, Midland, Michigan. 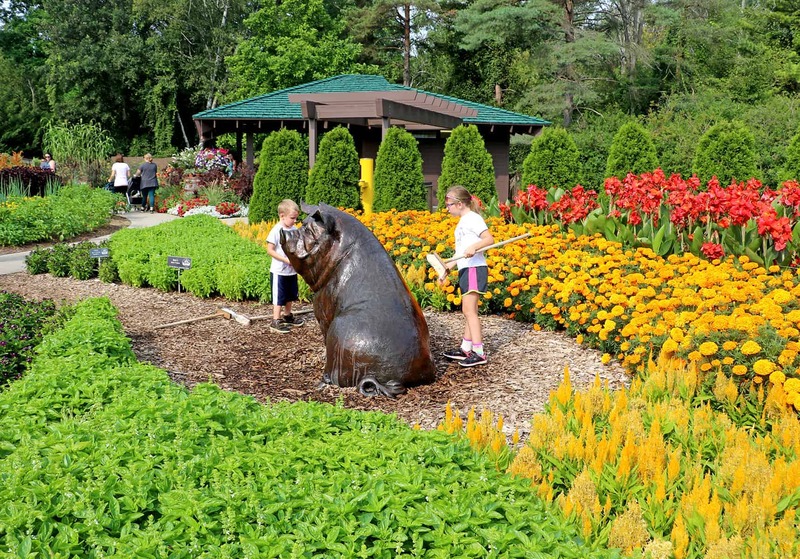 Dow Gardens Children’s Garden is a vegetable and flower display garden allowing guests to see and interact with the edible and flowering plants (yes, it is ok to pick and eat!). This year, the garden had 30 varieties of AAS Award Winning plants grown to create its dynamic, colorful and eye-catching display. The meticulously planned and tended rainbow bed was planted around the famous Sir-Ham-A-Lot the Pig. Many AAS winners (South Pacific Scarlet canna, Fresh Look Yellow celosia and Jam ‘N Jellies Blackberry vinca) were used and included Dolce Fresca basil for the green strip of the rainbow. Another combination of Gretel eggplant and Prizm kale bordered the bed with pops of Warrior bunching onion to create a vertical flare. The Garden hosts numerous programs throughout the summer including a Growin’ Gardener Program in which 84 families enroll to get hands-on experience growing vegetables and annual flowers. Second Place Winner: Norseco at the Botanical Garden of Montreal, Montreal, Quebec, Canada. In the same vein of the pollinator challenge last year they installed 35 varieties of All-America Selections winners using as many vegetables as flowers to demonstrate the beauty, utility, and pleasure of including vegetables in a development of foodscaping. Trellises and climbing structures were installed in the garden then all AAS Winner varieties were clearly marked and accessible. Third Place Winner: Boerner Botanic Gardens, Hales Corners, Wisconsin. Boerner utilized a trend-setting chevron-style garden design to highlight this year’s theme of Foodscaping. A trellis grown with 1991 AAS Vegetable Winner Kentucky Blue Pole Bean and South Pacific Scarlet canna around the base anchored the points of the chevron. In each of the stripes of the chevron, healthy and lush vegetables and ornamentals were grown side-by-side. Artwork broccoli grew as a backdrop to Mega Bloom Pink Halo vinca and Pretty ‘N Sweet peppers were accented by Asian Garden celosia.